Gillette Fusion Proglide. Gillette's best shave, even if you shave every day. Fusion ProGlide's breakthrough blade technology helps deliver Gillette's most comfortable manual shave ever. Its thinner, finer blades provide significantly less tug and pull and effortless glide. It is Gillette's most advanced Shaving System. Not only is the new Gillette® Fusion® ProGlide™ our most comfortable shave, it also turns shaving into gliding. Re-engineered to reduce annoying tug and pull, the Fusion ProGlide's razor blades are thinner than Fusion blades and feature an advanced, low-resistance coating to cut through hair with an effortless glide. The improved blade stabilizer helps maintain precise razor blade spacing for optimal comfort, and the redesigned handle now has larger, more ergonomic grips for better control. With more lubricants and a touch of mineral oil, the enhanced Lubrastrip™ is now larger. And the redesigned precision trimmer now features an improved razor blade, anti-clogging rinse slots and a streamlined comfort guard that channels away excess shave prep. Plus, the MicroComb, found exclusively on the Gillette Fusion ProGlide Power, helps guide hair to the blade. A Blade Stabilizer to maintain optimal blade spacing for comfort, while allowing the blades to adjust to the contours of a man's face. An Enhanced Lubrastrip™, larger than before, infused with mineral oil and lubricating polymers, enabling the razor to move smoothly over skin even on repeat strokes. An innovative Microcomb that helps guide hair to the blade. What makes Gillette Fusion® ProGlide™ better than Gillette® Fusion® Power? What makes Fusion ProGlide better than Fusion is technological innovation. The razor has been reengineered and redesigned to create Gillette's Most Comfortable Shave. Gillette Fusion ProGlide Power shares the same core technology as Gillette Fusion ProGlide: thinner, finer blades, a low resistance coating and the redesigned Precision Trimmer Blade. - The redesigned handle now has larger, more ergonomic grips for better control. How does the Gillette Fusion ProGlide™ handle compare with the Gillette® Fusion® handle? The Fusion ProGlide Power now has ergonomic side grips for better handling. How long will the Gillette Fusion ProGlide™ cartridge last? How long a razor cartridge lasts varies from person to person, as it is dependent on many variables such as beard toughness and thickness, beard preparation, shaving habits, and skin sensitivity. The Gillette Fusion ProGlide Power's reformulated Indicator® lubricating strip will provide you with a visual cue - it fades to white - when optimal shave conditions have been reduced. When this happens, you may want to change your cartridge for a more comfortable shave. What are thinner, finer blades and how will they improve my shave? Gillette Fusion ProGlide Power™ razor has 5 blades spaced closer together, forming an advanced shaving surface. The razor blades are thinner than those of Fusion-a design that allows the blades to be even more flexible. Gillette Fusion ProGlide Power™ features a new Streamlined Comfort Guard. The soft, flexible material surrounds the microfins, creating an outer edge that wraps around the sides of the cartridge and channels that clear away excess shave prep. This Streamlined Comfort Guard follows the contours of your face to help the shaving surface of the razor comfortably shave close. Will the Gillette Fusion ProGlide™ cartridge fit any other razors on the market? 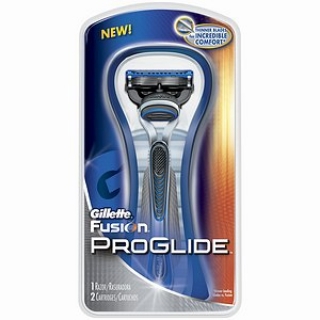 The Gillette Fusion ProGlide Power cartridge features a new razor blade that fits on any Gillette Fusion, Fusion ProGlide or Fusion ProGlide Power handle. Is it okay to let my girlfriend or wife borrow my men's razor? For both hygiene and performance, it's not a good idea to share your razor with your partner. Women have a much larger area to shave and you may find that after only a few shaves, your blade has dulled considerably; increasing the likelihood of nicks and cuts. Tell her to try a razor specifically designed for the way a woman shaves, such as Gillette® Venus® Embrace®. Men's facial hair tends to grow in different directions. Start by shaving with light, gentle strokes with the grain. Then, if necessary, go against the grain for an even closer shave. The entire razor is discarded when you are through with a disposable razor. With a refillable razor, only the blade cartridge is replaced. Refillable razors like Gillette® Fusion® ProGlide™ and Gillette Fusion incorporate more advanced blade technology and ergonomics vs. most disposables for great control and a close comfortable shave. Gillette's research has demonstrated that single blade technology, which has been applied since 1901, is demonstrably inferior to twin blade shaving systems such as SensorExcel®, and even more so to 5-blade systems such as Gillette® Fusion® ProGlide™. But the number of blades alone does not ensure a superior shave. The 5-blade shaving surface of Fusion ProGlide Power™ features progressive blade alignment, patented blade coating process and a flexible comfort guard which collectively provide Gillette's best shave. The area above the upper lip is tricky for many men. To help avoid nicks and cuts, always leave it for last. Apply plenty of shave gel and allow this area to soak up as much lather as possible. When shaving, don't apply too much pressure. Gillette® Fusion® ProGlide's™ Precision Trimmer is really useful when shaving under the nose.